GoDaddy makes registering Domain Names fast, simple, and affordable. Find out why so many business owners chose GoDaddy to be their Domain Name. GoDaddy served approximately 13 million customers and had 4,908 employees worldwide. The company is known for its advertising. Now click on the "Domain Details" of the domain which you have bought. 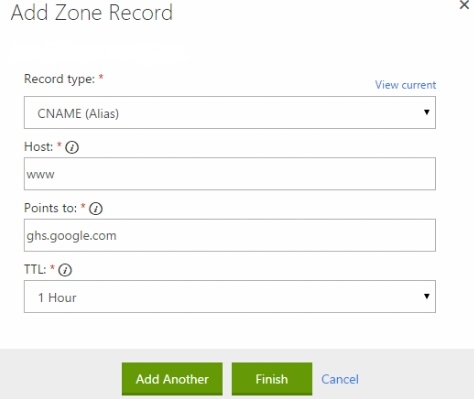 Go to the "DNS Zone File" Section and click on "Add Record"
Fill in the details for the CNAME record as shown in the image and click "Add Another"
You are now Done with GoDaddy settings.move to your Blogger blog to activate your new domain. Now Blogger wants us to create another CNAME record on GoDaddy to verify that you are the owner of the domain. The values for Host and Points To should match what’s shown on the Blogger error. Click Finish and Save Changes once again. Now go back to Blogger and click on the "Save" button once again. This time the verification error should go away. Now note that the DNS changes which we had made(the A and CNAME records) might take some time to propagate. Just try to give it 24 hrs. Great insight. I like GoDaddy a lot!